Today I bring you the legendary skateboards deck which are inspired by the king of the road series. 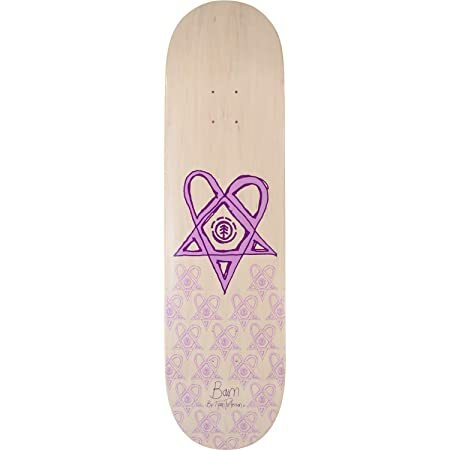 I will introduce you to four unique and high-quality skateboards, featuring Bam Margera, a professional skater. The decks are designed by Element Skateboards, one of the most prestigious skateboard brands in the community. If you are a fan of Bam, you definitely appreciate these decks and his contributions to the skateboarding community. I have also included some of the best performance videos of Bam for your interest. So sit back, relax and enjoy the nostalgic moments of Bam Margera throughout this article! Wanna feel alive every time you skate? This deck is all about being awake and focus on the board. The deck size of 8.2 x 32.2 inch, which is suitable for both beginner and professional skaters. Then you have Bam himself woke up gradually on his bed, this scene was featured in King of the road season 3. Don’t take this picture design as ordinary by the simple look of it. The meaning is embedded between the ordinary routine of Bam and the noise coming from the loudspeaker. You can infer in this context is Bam does not give a damn about what others say about him. Like in real life skating, your skills, style, and character are unique. Don’t let other noises from outside influence who you really are. Fun and individuality are what skating about. Most importantly, you have the “Thrasher” logo with the sign “King of the road” right in the middle of the deck. Yes, if you are a passionate skater, you should know about the Thrasher Magazine and the TV show “King of the road”. They feature professional skaters performing their favorite tricks. Besides that, the logo also indicates you are a strong and competitive person. It takes lots of skills and confidence to become a King of anything in real life. We are all aware that skating for fun is just a beginning to something greater. To become a professional, it requires focus and countless hours of practice. In my opinion, this is a must-have deck that most skaters will love. Not only because of Bam Margera’s attributes but also for the style that we present anywhere. Regardless of your level and trick styles, this deck is the perfect choice for you in many ways. If you are a fan of both street art and skating, this deck is definitely for you. From the first look, this deck has a simple design. It actually has a great combination of the artistic style and ordinary colors. You undoubtedly look more stylish and attractive when you skate outside. You see the tip is designed with the mystic symbols. These will stand out with the light as you perform tricks like flips, spins, and grinds. Furthermore, the heartagram symbol is likely to catch everyone’s attention, thank its unique paint and artwork. The pentagram symbol presents for magic, mysteries, and unexplained wonders. While the heart is all about love and care. We can briefly interpret the heartagram as “you have a mysterious and incredible love for skating”. 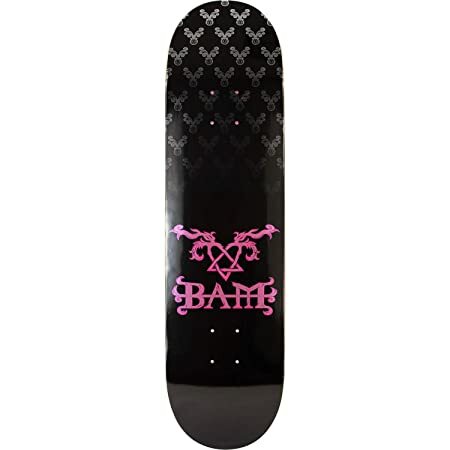 The deck also has the word “BAM” beautifully painted near the tail section. This clearly informs the professional skaters about Bam Margera himself. 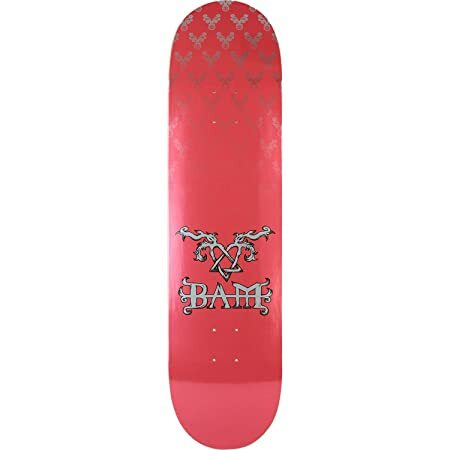 Though the newbie skaters might mistake it for the bam noise when you land on the board or the “Bam! I got ya” meaning. Then you can at least show off your knowledge about the legendary Bam himself. Either way, it looks cool and amazing to have such deck in your collection. Girl skaters will find this absolutely cute for their collection, while the boys can hesitate due to the colors combination. If pink and silver are not your favorite colors, don’t worry and keep on reading cause I have two more designs for you. Also, some interesting links are in the next section, all about Bam and a young professional skater (stay tuned!) for your learning. Here is an alternative to the Pink/Silver deck. With the same design and materials, the black and pink colors are the great contrast for you boy skater here. This color set would also highlight your performance at all times. Black presents a strong, professional and determined character of yourself. To achieve an impressive style, you need the determination of everyday practice. Hence, the black color will likely to last longer and blend well with the scratches you made during practice. We boys will do what it takes to stand at the same level as the professional Bam Margera. Never stay comfortable in your comfort zone, and keep on skating to the greater length of our life journey. I hope this deck will be the right choice for you to show your endless love with skateboarding. The below link is a classic yet amazing clip of Bam Margera when he was young and passionate like you. Do you see sometimes he fails his trick? Did he give up after he falls? NO, this is what I have emphasized above, determination makes you perfect. Getting out of your comfort zone and picking up a skateboard is hard. Every time you perform a trick, regardless of your level, there will be a chance that you fail. Those do not feel embarrassed and pull themselves up every time they fall, are the one deserve the title “King of the road”. You don’t need other people to give you any titles in real life. Instead, you EARNED it with your practices, skills and personal styles. 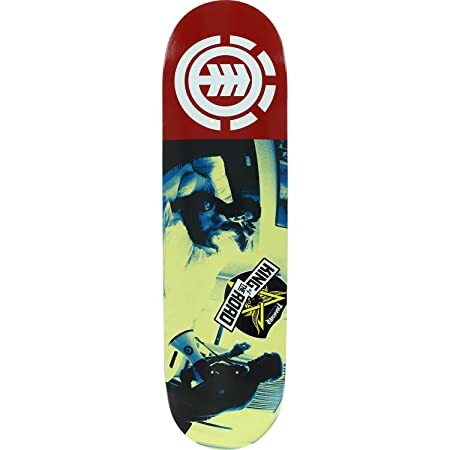 Last on my list is the deck with Tyson Peterson’s signature. If you watch the TV show King of the road then you would know Tyson is a professional skater. Even though Tyson is young, he has a great passion for skateboarding. To fully appreciate his incredible balance on the skateboard, I have provided a link below of his profile video. This deck features a cleaner look with white and pink colors. Thus, you can enjoy the original wood patterns. Both Bam and Tyson had a great relationship during the competition for King of the road season 3 (link is provided in the first section). The heartagram is not only about love but also respect from each other — as they both professional skaters, regardless of their age gap. In addition to the original look, the Element logo is nicely painted in the middle of the heartagram. Other people will recognize instantly the quality of your skateboard and your level. I personally like this design as it is unique with Tyson’s signature. It reveals a connection and friendship that both Tyson and Bam have for each other. This reminds us of whatever situation we are in, we are always friends and learning from each other. Skating helps us to be alive and creative in our trick performance. From the four decks, I have introduced above. They worth your value both the high-quality materials and the unique designs. I think they will serve you well on the journey of developing your skating skills. Don’t worry since these decks won’t differentiate if you are a beginner or a professional. It is up to you expressing who you really are and the level you are now. Bam Margera is a great character for everyone to learn from. He inspired many young generations to skateboarding, not because of his skills but more about his passion. Through the design, we learn to appreciate from others as an individual level. We also respect everyone in the skateboarding community as a whole. There are more things in life that we can learn from this sport, as we progress our trick and perfect our performance.